A bedroom is not just a room for the bed. Although in some cases (when the space is limited) a bed is all that can be accommodated. In case you have extra space in your bedroom and you like the idea of having extra sitting or storage space, then you must check out some of the best bedroom bench ideas. The good thing about this piece of furniture is that it provides you with additional relaxing space when you are not ready for bed yet. Some are designed to be more functional by having storage spaces, while you can also go for an entryway bench. This bedroom bench is the perfect example for functional and rustic bench designs. The unpolished wood look provides a nice contrast to the luxurious appeal of the rest of the interior design. The storage space has a lock that lets you store your precious belongings. There is even an open lower space that can used a shelving for magazines. 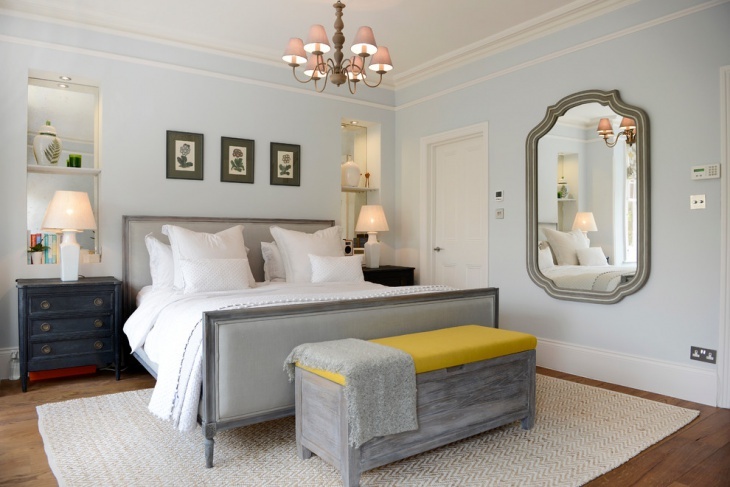 This upholstered bedroom bench in yellow and white is a gorgeous feature that adds elegance to the four-poster bed. It is the best relaxing piece of furniture that you can use for reading before going to bed. The elegance of white cannot be denied and this bedroom bathe in white is proof of that. To add a little contrast to the whiteness of the interior and furnishing, the bedroom bench used has unpolished wooden top, feet and bottom shelving (great for bedding storage). Take the cushion and this would be good for outdoor bench ideas. This small bedroom bench with metal frame is topped with white cushion that perfectly matches the light grey rug, white corner/side chairs and the bed. The bench is small enough that it does not take the limelight away from the bed, but functional enough to provide a comfortable seating option. The brown leather of this bedroom bench may have a manly appeal, but it certainly looks great in this master bedroom. The bench is perfect for breakfast tray or as additional space for sitting and relaxing. 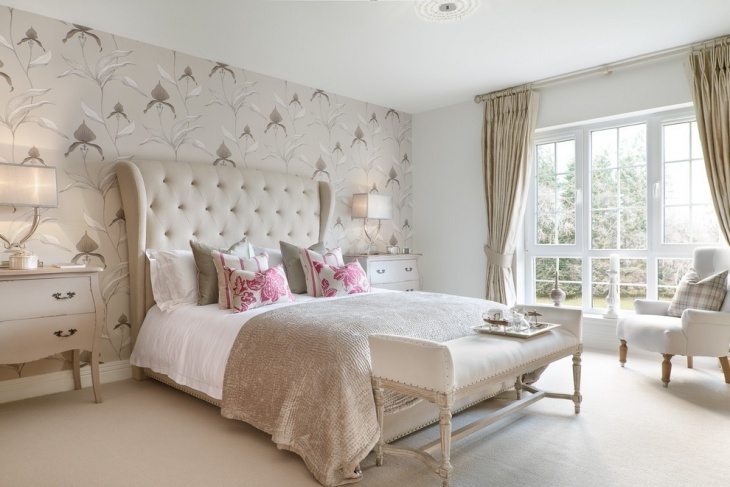 The elegance in this bedroom is enhanced by the bedroom bench dressed in Faux fur. The whole room is immaculately bathe in white and to emphasize the magical ambiance, the bench has glass feet. This bedroom bench has unconventional metal framing that it sort of stands out in this elegant bedroom. The white cushion used for the bench mathes the bed and the frame provides contrast to the rest of the interior design. The wide bed in this bedroom is matched to perfection with the long bedroom bench in greay cushion and rich dark colored frame. The grey and brown motif is manly, but the furry rug is definitely girly. The combination gives this room a nice contrasting effect. Bright yellow in unpolished grey? The combination may not be traditional, conventional or even normal, but the appeal of this bedroom bench is certainly unique and eye-catching. This loft bedroom may have low ceiling and limited space, but that did not prevent the possibility of adding a colorful bedroom bench. The bench adds both functionality and decorative feature into this simple bedroom. 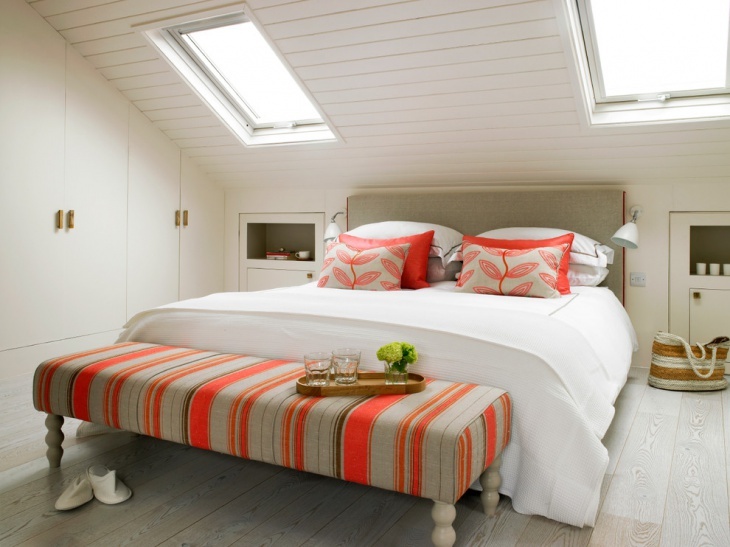 Adding bedroom benches is one way to achieve the best small bedroom ideas. 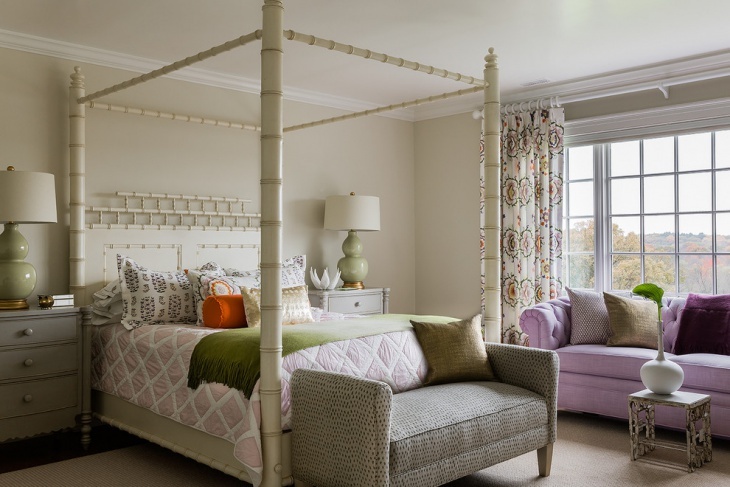 A bedroom bench provides additional seating feature, while it can also be used as storage or shelving. Of course, if you are going to chose an elegant looking bench, you will also add a nice accent into your bedroom interior design.